HOME > Books > Fiction > Kamikaze! The Australian pulp fiction novel Kamikaze! presents exciting battle action with memorable characters on both the Allied and Japanese sides. Peter Flynn, who served during WWII in the Royal Australian Air Force as a pilot of both fighters and bombers, wrote during the 1950s and 1960s several war novels set in the Pacific Theater and European Theater of Operations. These include Bandits - One Zero, Target Berlin, and The Zero. Flynn worked as a journalist prior to the war. The novel Kamikaze!, which does not indicate the year of publication, reflects his writing skills and his WWII battle experience, both in Australian and British air squadrons. This paperback includes three main story lines. The first tells the story of two kamikaze squadron pilots, Fukuzawa and Hanjo, who were stationed at Dulag Airfield on Leyte Island in the Philippines. The former had great pride in being a kamikaze pilot, but the latter had fear inside him. General Kawabe, leader of Japan's kamikaze operations, had his headquarters at Dulag. A squadron of P-38 Lightning fighters attacked and destroyed his headquarters in an attempt to kill him, but he was not there at the time. Japanese fighters, including two George (Shiden) fighters piloted by Fukuzawa and Hanjo, took off from the base to engage the P-38s, and only one American fighter escaped. Afterward, a squadron of six Betty bombers, each carrying an ohka  rocket-powered glider bomb, made a sortie from Dulag in order to attack the American aircraft carrier Wayne. The first ohka, piloted by Hanjo, got destroyed when the sole P-38 pilot who survived the raid on Dulag ran his fighter into the ohka speeding toward the carrier. The second ohka, piloted by Fukuzawa, got hit by a lucky bullet from a Catalina flying boat and crashed into the sea. Both the third and fourth ohka weapons succeeded in hitting the aircraft carrier Wayne, and Japanese conventional bombers finished her off. The Epilogue mentions that General Kawabe survived through the end of the war. The second story line follows the crew of a Catalina flying boat and their passengers, who are American and Australian war correspondents. When on a mission to drop mines in sea lanes and harbors known to be used by the Japanese military as they withdrew troops from Borneo to the Philippines, the Catalina gets hit by flak from Japanese guns on the ground and has to make a forced landing in a cove to try to repair a damaged engine. In the morning Japanese fire from the shore killed a Catalina crewman who had gone out to try to fix the damaged engine, but the flying boat escaped after hiding in a fog bank, and another crewmen finished repairs to the engine. The quiet American journalist from the Chicago Tribune, Bob Cushman, disclosed during their flight that his wife was Japanese and still living in Japan, which caused great resentment by an Australian crewman. The Catalina sighted ten Betty bombers, including three carrying ohka weapons, headed toward an American aircraft carrier Wayne. Their early warning allowed Allied fighters to intercept most of the Bettys, but one ohka got through and hit the carrier. Kawabe ordered another squadron of Betty bombers carrying ohka bombs, including two piloted by Fukuzawa and Hanjo, to finish off the damaged ship. The Catalina flying boat luckily shot down the second ohka piloted by Fukuzawa, but then two Japanese Shiden fighters quickly shot down the Catalina. The crewmen and passengers had to parachute out of the aircraft as it spiraled down to the sea. They got picked up by Japanese torpedo boats, and the journalist Cushman with his Japanese ability confessed to being the one who destroyed the ohka, which gave the other men enough time to be rescued by American Corsair fighters and a cruiser. The book's third story line describes the P-38 Lightning fighter squadron that had a mission to kill General Kawabe, the man in charge of all of Japan's kamikaze attacks. The P-38s planned to take off from the aircraft carrier Wilson just before dawn in order to attack Dulag Airfield, about an hour away. The carrier came under attack by six kamikaze Zero fighters, each carrying two 500-pound bombs. Two kamikaze planes hit the ship, killed 80 and injured 170 men, and destroyed five of the twelve P-38s to be used on the mission to destroy Kawabe's headquarters at Dulag. The remaining P-38s managed to take off from the heavily damaged carrier, which later was presumed to have sunk with no survivors ever located. Only four P-38s survived an aerial battle with eight Japanese fighters soon after they took off from the carrier, and these remaining fighters proceeded to Dulag and destroyed the hotel where Kawabe had his headquarters. However, Kawabe did not get killed as he had stayed that night at the airfield rather than the hotel. Captain Bill Knox was the only pilot to survive the attack on Dulag, and he barely made it back to the aircraft carrier Wayne. When Betty bombers with ohka weapons were flying toward the carrier, he was given permission to take off and make a suicidal crash into the first ohka rocket-powered glider headed toward the ship. The novel's details regarding the Kamikaze Corps are clearly fictional. The Japanese Navy did not use the ohka rocket-powered glider bomb until March 21, 1945, whereas the book depicts Betty bombers with attached ohka weapons that were used in the fall of 1944 in the Philippines. 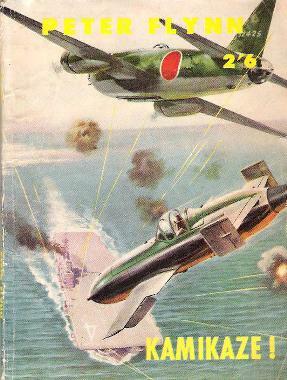 In real history the Kamikaze Special Attack Corps was part of the Japanese Navy, but in this fictional work an Army General is the commander of the Kamikaze Corps, and Army pilots fly Navy Zero fighters. The novel's ohka weapons have two rocket units under the wings in addition to three in the rear, but the actual ohka aircraft did not have rockets under the wings. A real ohka pilot would have climbed into the ohka cockpit when a Betty bomber neared the release point , but the book depicts pilots in the ohka cockpits when the Betty bombers took off from base. We do not wish you to describe Kamikaze attacks as being suicide tactics. The Kamikaze pilot regarded himself as a human bomb which was going to destroy a unit of the fleet destroying his country. He derived glory from it. Whatever you may think about the Kamikazes, you can be certain that the pilots died happy, in the firm conviction that their sacrifice was one more step towards the Emperor's victory. The aerial battles depicted in Kamikaze! do not favor one side or the other with both the Japanese and Allies achieving victories and suffering defeats. 1. Throughout the book both the Allies and Japanese use the term "baka" to describe the ohka weapon. Baka was the derisive term applied by the Allies after the first deployment of the ohka weapon on March 21, 1945. Baka is a Japanese word that means crazy and foolish, so it seems comical that General Kawabe and the ohka pilots would also call the weapon a baka. 2. Naito (1989, 73, 154, 181) mentions several times that pilots climbed down into the ohka's cockpit when the Betty bomber neared the position where the ohka would be released. Naito, Hatsuho. 1989. Thunder Gods: The Kamikaze Pilots Tell Their Stories. Translated by Mayumi Ishikawa. Tokyo: Kodansha International.